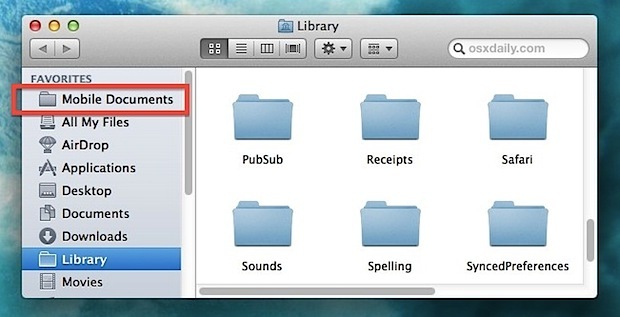 Since OS X 10.7.2 onward, you can access files stored in iCloud directly from the OS X Finder. Furthermore, if you have multiple Macs configured with iCloud and running Lion or Mountain Lion, you can actually use this hidden folder to sync files between Macs with iCloud, much like DropBox. With OS X and iOS becoming increasingly dependent on iCloud, having a quick way to access those iCloud documents can be useful for power users. Before beginning, you will need iCloud set up and configured and you must be running OS X Lion 10.7.2 or later, or Mountain Lion. Note this is not necessarily in modern versions of OS X like OS X Yosemite and OS X El Capitan, which provide direct iCloud Drive access from Finder windows. If you poke around the “Mobile Documents” directory you’ll find another series of folders, some are named nonsensically based on GUIDs as this folder is not intended for general user access, but each one is in accordance to an application that stores documents in iCloud. Apps including Notes, TextEdit, Reminders, Mail, Keynote, and any other Mac app with iCloud support will be included. Making changes to a document that syncs with an iOS device will reflect in the appropriate app from iOS. Likewise, for any documents stored in iCloud the changes made to the folder will reflect on other Macs. Versions does not work here, so be careful with changes you make. One thing you may notice is that Camera Roll pictures are not stored in here, but there is a similar way to access the iOS Photo Stream from Mac OS X too if you use that feature on an iPhone or iPad. If you want to edit the documents in question with an iCloud compatible app you should just open them from iCloud and save them to iCloud. Most Apple Mac apps do this now. How do you do this when there isn’t a Mac equivalent of the iOS app? Or in a different app, for that matter. Consider Downcast on iOS. There is icloud sharing, presumably to sync between an iPhone and iPad. However, I want to access the OMPL for some reason. There’s no Downcast for Mac. Or (my real scenario), on my iPhone I using iA Writer. On my Mac, I’ll use either Mou.app or Sublime Text 2. I know I could purchase iA Writer for Mac, but I already have n text editors. And, I like how Mou will preview compiled Markdown alongside the plain text, or I am already working in ST2. Is the only course of action to use a hidden folder with poorly named subfolders? This does not work. When I try to drag the Mobile Documents folder to the Finder sidebar, I get the grey circle/slash icon and so I can’t drop it anywhere there. I then created an alias of ‘Mobile Documents’ and dragged this one to the Finder sidebar. That works fine for me. Thanks for sharing this nice feature. Yes, same with Rick and Michael. And the alias way works. Making an alias and dragging it into the sidebar didn’t work for me on an iMac running Mountain Lion. Can you access these folders from anywhere like Dropbox? If so, how? Tried this and it worked! You do have to create the alias to get it into the favorites, but then yes, you can put about anything there and get at it with another Lion or Mtn. Lion mac on the same Apple ID. Took an MS Office doc and dropped it into the folder on my work computer, opened it up at home. Thankyou… exactly what I was looking for. I couldn’t work out how to get a Numbers sheet into an email I had written, drag and drop works great from these folders. I’m on Mountain Lion and had to create the alias for it to work too. Good tip on versioning too, thanks again. So I Command-Shift-G and input path to Library but I have no “Mobile Documents” folder or anything named that. Same here using Lion. No “Mobile Documents” folder. Help please. I don’t have the “Mobile Documents” folder either, am on Lion 10.7.5, did you ever work it out?? Same here. I have a Mobile Safari. Not very fond of Lion, but the machine I am on is like 4 years old. I did it differently…I launched the application that had the file I wanted to email- it brought up the window with all of my iCloud documents…then I dragged and dropped the doc into the body of an email message. I made a series of alias files and then organized them into a new folder setup in my documents. It’s not idea, but it’s easy to grab files that I need without having to decipher GUID information. In my documents folder I setup a directory called iCloud, and inside that setup Pages, Numbers, etc. – I then created a bunch of alias files to the document folders for each of the Mobile Documents app folders and placed them inside.